Something felt off with the car when Carmen Pagan started it the other day. As she sat in the driver's seat trying to figure out what, she asked her 13-year-old daughter to get out to see if she noticed anything. The girl did. The back tires were flat. Pagan got out and saw why. Someone had slashed them. She had no proof. 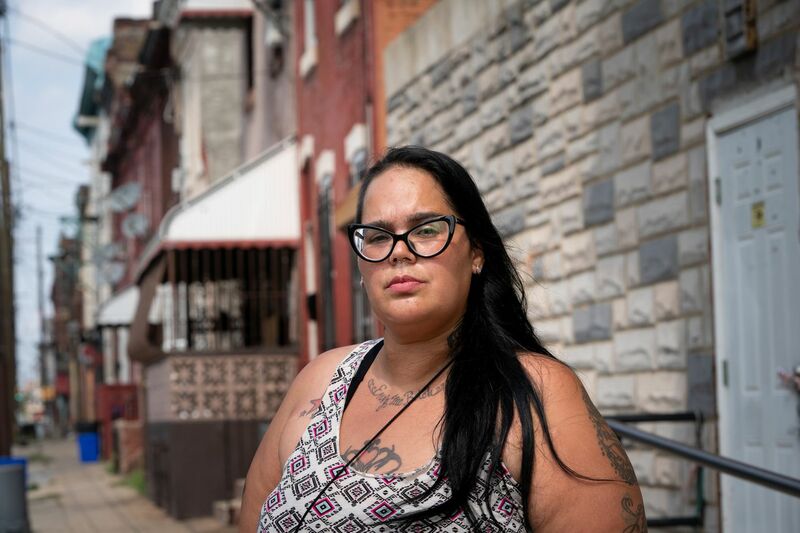 As far as she knows, no cameras point at the parking lot across the street from her Fairhill home — if there were, maybe people wouldn't feel so free to dump their used needles there. A message from the drug dealers who want her to stop calling attention to them. The kids on the corner of Kip and Cambria Streets sometimes seemed to find her mildly entertaining when she'd drive up, metal bat in hand, looking for her son, Elijah. But then she started blasting their business on social media, in hope that maybe she could shame him from the corner — or scare him. "Philadelphia Police Department," she begged. "Please pick my son up from Kip and Cambria area where he is selling drugs before they kill him." I wrote about her doing this before, last year. But before anyone in the neighborhood seemed to notice or cared, police caught up to him in a stolen car and arrested him. She got threatening messages from people she didn't know. They called her a snitch. Stop, they warned. That's when someone cut her tires. She had hoped this was all behind her. For hours last year in Family Court, I sat with her and her son's kindergarten teacher as Pagan, in part rant, part confessional, talked about the road that had led her to the overcrowded waiting area. She wasn't much older than her son was when she started taking and selling drugs. He was only 6 when she went to prison for five years. She'd vowed she'd make up for mistakes. And in many ways, she had. She got her college degree, she wouldn't stop looking for a job no matter how many times she was rejected for the felonies on her record. Just this week, she landed a full-time job at a community program for youths. She's become an increasingly vocal activist against the drugs and gun violence that killed her brother in 2016. Mother and son have gone to therapy. Loud arguments have ended in tears — a son's who couldn't get past his anger, a mother's who was terrified that maybe, sometimes, it just may be too late. But at least he's alive, she'd say as we sat in the hard chairs. Maybe some time inside a residential juvenile facility would change things, she thought. And it seemed to, for a while. He turned 18. He got his GED, and a scholarship to Community College of Philadelphia. Once out, there was a job at UPS and a friend who was teaching him how to work on cars. There were signs that his anger and rebellion were beginning to pass. Then he was back on the corner. She told him to go. There were three other kids in the house. She couldn't have him bringing his disrespect and who knows what else into her home. But she hadn't given up on him. There were other ways to go to the supermarket, her mother's house, the kids' schools, but she almost always went past the corner, and every time she saw him, she'd try to chase him off, bat in hand. No apologies, no fear. And last weekend, she took to social media again with a picture of one of her flat tires, and railed against whoever did it. She got offers of help. Some for tires. Some for protection. Some dripping in judgment. "Where are the fathers?" Not around. That's really all there is to say about that. She'd be the first to dwell on it if it made any difference right now. She used the money she'd saved for the kids' first day of school and got the tires plugged. Then she drove straight to the corner. The next day, I went back to see if I could talk to her son. At first, the young men on the corner pretended not to know who he was. Then one, smirking, told me he'd gone on vacation with a girl. "What are you, with an agency?" another young man asked, his tone making it clear no one there needed help. Pagan's son wasn't there. But what was, just steps from where the young men stood, was a memorial to someone named Angel. How'd he die? I asked a man standing outside the Vargas Mini Market. Shot, he said, and shrugged. This is what this mother fears, I thought as I stood there. When last here, Pagan had shouted at them. "When they kill you, guess who is going to be out here rallying for you," she asked. "It's not going to be the people using you guys as pawns … it's going to be me and your mothers." Go home, her son told her.